Some of you might remember the Thai cooking class I had attended two summers ago, or not. If not, just click-through and you will have yourselves a delightful recipe for Mango Sticky Rice. I have been wanting to make the roasted red chile sauce that Chef Suzanne taught us in that class, for the longest time. It is a variation of Nam Prik Pao, for which recipes abound on the interwebs. 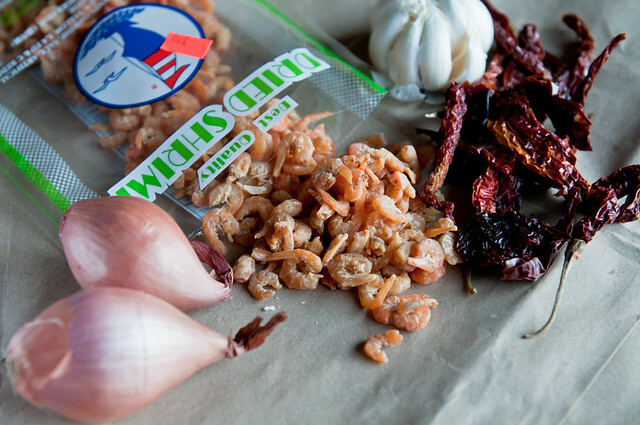 I bought a variety of dried shrimp when we were in California that summer but never got around to using them. I figured that since they were dried, they would last reasonably forever or at least until I finally decided to cook them. It was not to be because all of them had become limp, grown a white layer and smelled downright nasty. So nasty that I had to open the windows to air the house even though it was below freezing outside. My fallback was the package of dried shrimp I had tucked away deep in my refrigerator but, alas, that smelled just as bad and looked worse. I double-wrapped everything in paper bags and, with a heavy heart, I sent it to the compost bin. When things like this happen, I usually give up and give in to the saying that "the universe is telling me not to make this roasted red chile sauce and there is no point in working against that energy." But I was driven that day and I finally made it to the Asian Seafood Store in Boulder. Once there, I was chastised by Maria, the owner of the store, for bringing dried shrimp all the way from California when she has always stocked and sold them. Yes, ma'am! Heat oil in a frying pan. Fry the shallots and garlic together until golden brown. Remove from oil and drain. 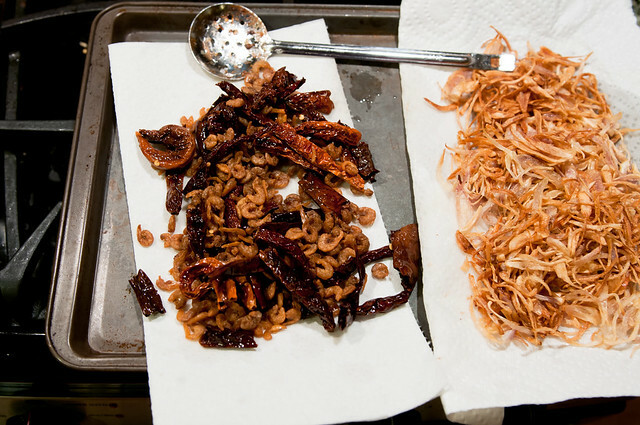 Next, fry dried shrimp and dried chiles in the same oil until golden brown. Remove from oil and drain. Blend together cooled oil, fried ingredients and all remaining ingredients into a finely textured sauce. In a good blender, this takes about 3-4 minutes. In mine, much longer and more coarse than fine! Coarse textured sauce that really should be finely textured. This sauce should be stored in a glass jar and can be refrigerated for upto 3-4 months. 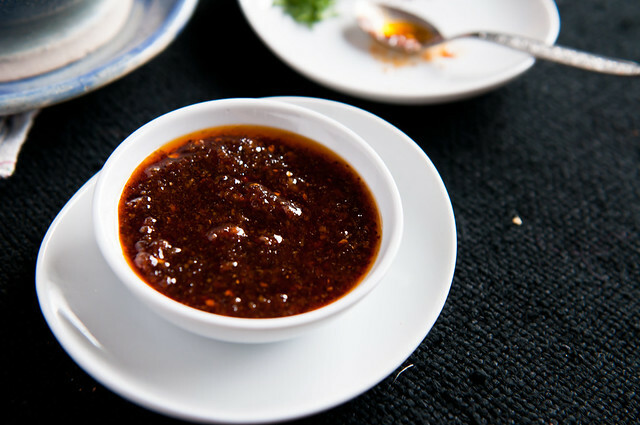 There are a zillion recipes for Thai roasted chile sauce or Nam Prik Pao. Most of them say that the ingredients should be fried individually. I can tell you that there's no harm or foul if you fry them together as in this recipe. However, I can understand that the layers of flavor will be different if fried separately. If you have time on hand, please do fry them separately. I make my own tamarind concentrate from fruit pulp and therefore add a little more than if I were to use tamarind concentrate from a jar. Suzanne Rudolph recommends that you remove the seeds from the dried chiles as that removes a bitter edge from the sauce. I was lazy and I don't mind bitter so I left the chiles intact. Traditionally, this sauce is made by pounding the ingredients together in a mortar pestle, as Pel recommends. Pounding is rather meditative, like stirring, but in this case I opt for quick and go with a blender. Also, my mortar pestles aren't big enough to hold about a pint of sauce. If you use dried red Thai bird chiles, use only 1/2 cup of loosely-packed chiles. Byadgi chiles are milder so I upped the quantity. My sauce is still rather mild. I absolutely love this sauce. I eat it as is, add it to rice, to my soups and even use it as a spread on toast. I felt rather validated when Pim suggested the same thing on her blog. My family was not, and still is not, as sold on this sauce as I am. They did, however, enjoy Thai-style butternut squash soup. Add diced onion and chopped ginger and cook until it turns translucent, about 3-4 minutes. Add roasted red chile sauce, butternut squash, salt and pepper. Stir and bring to a boil. Reduce heat and simmer until the squash is fork-tender, about 30 minutes. Alternatively, cook this in a pressure cooker for one pressure release or whistle, or according to your pressure cooker's instructions. 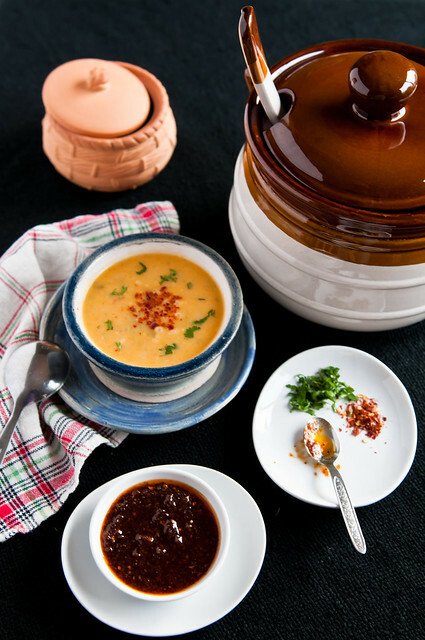 Use an immersion blender to purée the soup or allow it to cool and purée in small batches in a traditional blender. Add coconut milk and stir to mix well. Garnish with chopped cilantro leaves and serve hot. This soup takes the classic butternut squash soup to a new level. It is spicy and if you like ginger as much as I do, add some as garnish with the cilantro. This soup tastes even better the next day. It's the perfect foil for this cold weather and if, like us, you too have been taken down by the nasty cough and cold virus that has been doing the rounds lately. How often do you get two recipes in one post here on IFR? Consider this your New Year's bonus but don't get used to it because I still struggle with posting recipes on a regular basis. I do not cook for my blog, I cook for my family. What they like and approve of and what I will make again and again, that is what I share here on IFR. Initially, I wanted to add a recap of 2012 to this post but I decided that the best way to start 2012 would be with a recap instead of ending the year with one. Expect some memories and pictures in my first post of 2013. Happy 2013 to all of you! I am so glad that you are still here, reading and engaging with me. I hope you stick around for another year of sharing here on IFR because 2013 is the year that Indian Food Rocks turns 10! Not one, but two recipes!! That's a bonus alright! Love, love man prik pao, but mine didn't have shrimp. Believe it or not, I have dried shrimp in the fridge that I picked up from Bombay on a previous visit. I have been meaning to look for a recipe using them and here's a good one for this cold, cold weather. Happy New Year to you, M and D, Manisha! And wow! that chili sauce is sure to make tastebuds sing. A Very Happy New Year to you and your family!! The dried shrimp reminded me of "sode", "sukke bombil" and the likes. nouvelle annee ! Happy New Year , Manisha ,and your home -tasting crew ! look forward to the 10 year anniversary celebrations ! congratulations Manisha, from lovely warm summertime Tasmania 1 john k.
Wonderful photos - and I can almost smell these dishes! Also, saying again that it was so great to spend some of our time in NM with you and the family! Thanks for making it happen! Nam prik pao is wonderful alright. Use it for tom yum soup . yum! The dried shrimp I've seen in India are quite limp (and have the head and tail on) and not so plump as the ones you've shown here. We call them "galmbo" and use it in a dry coconut chutney which makes an awesome combination with plain rice. My name is Pratishtha Shrotriya Khan, and I am running a year long Breakfast Project wherein I am cooking 356 different breakfast recipes within 365 days. And to celebrate 200 days of the project, I am running a contest! madteaparty, make it! And then use it in Tom Yum Goong! Make 2013 the year to visit Colorado, please! Pel, practically, yes! I don't think I would have come up with it on my own though. Costco has diced organic butternut squash which makes this soup even easier to make! Thank you for validating Chef Suzanne's recipe. She's pretty awesome! ISG, it's good chile sauce! You can halve the recipe if you don't want to make so much. Try it! Ameeta, that's exactly why I love this sauce! It has flavors from my childhood that I don't find easily anymore! HNY! John, it's funny though that blogs that started in the last year or two may have more posts than mine! But still, it's 10 years since I started writing here! Thank you for your wit and humor, I look forward to your comments, always! Dot, I am so glad that everything worked out just like clockwork! 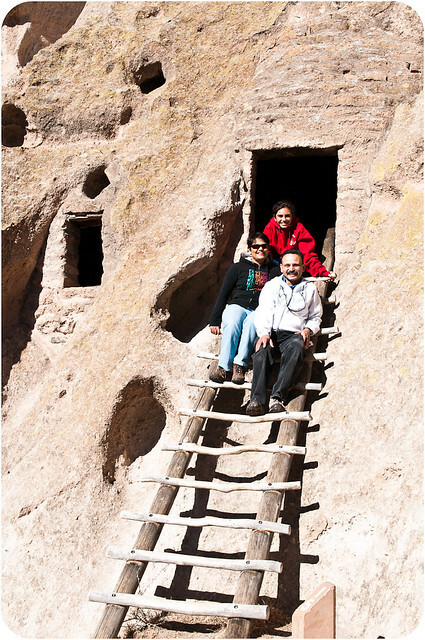 D & M are a treat to travel with and are always willing to do things on an impulse. Our whole trip was last minute and that's why meeting you, Mark & Don in ABQ was super awesome! Joyce, I bought some that are very like the small dried Indian shrimp. I want to make kismoor with those. I wonder if your dry coconut chutney is similar to our kismoor. If you're willing to share your recipe, do send me an email: indianfoodrocks at gmail. In Chef Suzanne's class we used humongous shrimp. They were about 3-4 times the size of these. I think the important thing is the shrimp flavor. So if you were make this sauce, you would have to figure out how much to use based on taste. Pratistha, good luck with your project! Your chilli paste turned out so delicious. I fried some bhindi and added this paste and wow! Thank you. Poornima, thank you for trying this recipe and sharing yet another way to enjoy it. I would not have thought of frying okra and adding this sauce to it. I will try that the next time I buy some plump bhindi! I take no credit for it! The idea to use okra was born out of a stray comment on some blog by someone who mentioned okra with shrimp paste she saw someone order in a restaurant. Thus are recipes born!! It is really good with fried rice and fried eggs too. Yours looks fantastic!